On November 23rd a woman in Yavapai County, Arizona, robbed a Chevron mini-mart by putting one hand in her sweater and claiming she had a bomb in order to get cash from the register. The clerk refused, and the suspect fled the scene. The crime occurred at about 6:15 p.m. and the woman’s identity was discovered merely an hour later. Andri Jeffers, 26, was made by the clerk who wrote down the license plate number from her Chrysler Pacifica. A surveillance photo didn’t hurt either. 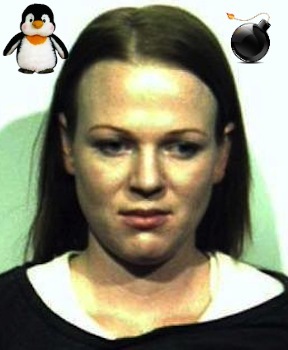 Deputies arrived at her house, where she admitted to the crime and the fact that the “bomb” was actually a toy penguin. She was booked for one count of attempted robbery at the Camp Verde Detention Center. She should have been a stripper.